How many Kinaesthetics do you have in your class? How about Aurals? Or maybe there are more Logicals amongst your pupils? The chances are you have some of them all with a couple of others added in as well, even if you don’t yet know it. These aren’t the latest fads in bizarre names but a way of differentiating between the varying learning styles that separate the pupils in your class. The modern classroom uses a multitude of teaching techniques to elicit the best responses from children and help them to reach their full potential. By understanding the psychology behind their style of learning and the impact it has on their behaviour you will be better placed to understand how to not just react but inspire and motivate. 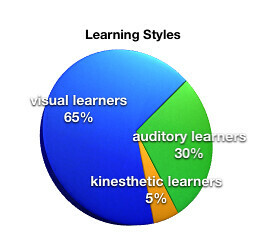 There are many different schools of thought regarding learning styles and a number of different ways in which to categorise the various groups. However, the net result is essentially the same; some pupils learn best through speech, others through movement and so on. By understanding the various different models you can adapt your teaching styles to produce the best results and overcome any problems in the classroom. Verbal: Can easily be confused with Aural in some cases, this is a preference for speech and vocal learning, along with the written word. Kinaesthetic (also known as physical): These learners prefer to be in an environment which focuses on ‘doing’ activities involving physical movement and touch. Logical: A preference for a style of teaching which is based primarily on reasoning and logic, as opposed to creative approaches. Social: Collaborative work with either a partner or in groups is the preferred method for this particular type of learner. Individual (also known as solitary): Desk-based learning in a quiet and private manner is the preference, in direct contrast to the Social style. Of the four main types of learning style, they can be grouped roughly into three: those who prefer auditory input, those who respond well to visual material and those who need to have a physical experience in order to progress. As you may expect, a class will never be made up from just one learning style…that would make life too easy! Instead, as a teacher you will be faced with the challenge of stimulating and managing a whole room of children, all with differing preferences and learning styles. Of course, you can’t keep everyone happy all of the time but you can learn to tailor your lessons in order to incorporate the important aspects from each group. Auditory learners respond the best to more traditional pedagogical types of teaching, and for this group lecture style learning would be successful. You can help to spice this up by making sure you vary your tone and inflection and using body language for emphasis. However, this type of learning is not for everyone so rather than adopting this approach, you could use verbal classroom discussions, speeches, individuals reading aloud or question and answer sessions as a way of fulfilling the auditory need. Visual learners need to be shown the subject rather than simply told. Reading them the lesson or just discussing the concepts are likely to go in one ear and straight out through the other. Diagrams, charts, films, animations or even written directions will also be more successful approaches for Visual learners. There is some overlap with the kinaesthetic group as Visuals will respond well to assignment notes, diaries, to-do lists, and other tangible prompts. Most children start off with a kinaesthetic style of learning but some move on to become either Auditory or Visual learners. However, a percentage remains as kinaesthetic learners for the duration of their years at school. In children with a learning difficulty, this is usually the most common preferred style. Kinaesthetic learners need to be immersed in the experience; to be given the chance to touch, feel and become involved in the activity rather than simply sitting still at their desk listening. Just as children have learning styles, teachers have their preferred style too and when these are diametrically opposed, problems can occur. If you have pupils in your class who don’t seem to be responding or are disinterested or unengaged, it may be worth considering whether there is a conflict in your styles. Kinaesthetic learners can often find lessons the most difficult if their particular style is not being accommodated. Finding it hard to sit still for long periods, children forced to endure long lessons focussed on auditory and visual learning styles, they can misbehave, and become easily distracted. Passive learning is not something kinaesthetic style children deal well with, preferring instead to be carrying out experiments or involved in other hands-on ways. However, if children who prefer to learn in a visual or auditory way are neglected they too will display hard to manage behaviour and could easily become disinterested. Very often dealing with challenging behaviour in the classroom involves taking a reactive role and disciplining a child after the problem has occurred. By learning more about learning styles and identifying each child’s particular preference, you can transform the classroom experience for them and in doing so; take a proactive step to manage their behaviour. With some careful planning you can offer opportunities within each lesson for pupils to work both individually and in groups, with roles as leaders, facilitators and coaches all included. This simple approach can alter behaviour both on and off task and provides plenty of opportunities for children to experience their preferred learning method. The concept of learning styles has been around for many years and whatever labels you want to give them, the ideas are very similar: identify the best way in which a child learns and help create a more meaningful experience for them. It’s important to strike a balance and not neglect all other styles but by ensuring there is material suitable for everyone, you could find behavioural problems within the classroom diminish and pupils are more engaged, interested and motivated. An article by Nathan Griffiths which was written in conjunction with www.academicsltd.co.uk/ Teacher and Training Consultancy.